CIMB Group Holdings Bhd’s asset quality has improved substantially in Indonesia but pressures persist in Thailand, based on the recently-released first quarter financial performance of the group’s subsidiaries in those two markets. On April 20, CIMB Thai Bank PCL reported a 39% year-on-year improvement in first quarter net profit to THB168.9 million. However, gross non-performing loans (NPL) went up 6.5% q-o-q to THB11.4 billion, which led to its gross NPL ratio increasing 40 basis points to 5.2%. This is higher than the Thai banking industry’s gross NPL ratio of about 3%. CIMB Thai president and CEO Kittiphun Anutarasoti tells The Edge he expects the bank’s NPLs to bottom out this year. He says the NPL ratio is likely to improve to below 5% this year as it looks to sell more NPLs. “I think this year we’ll probably see a bottoming out already. We have looked at our portfolio very closely and right now, run very tight asset quality management. We think that all the problems have already been identified. This year, we should see lower provision compared to last year,” he says in his first one-on-one interview with Malaysian media. “The NPL ratio, we will try to manage it down to below 5%. NPL ratio is [measured] against the loan book, so if the loan book doesn’t grow as fast, then you need to manage down the NPLs. There are two ways to manage down NPLs — one is through restructuring and the other is though a sale. This year, we are planning to sell some of the NPLs to manage the number,” he adds. Last year, CIMB Thai sold some THB5 billion in NPLs over three tranches. Two tranches were sold to external parties, and the other was to an entity within CIMB Group in a deal that was done on an arm’s length basis, he says. CIMB Thai plans to sell less than that this year, but the timing of the sale is unclear for now, Kittiphun says. Other Thai banks too have been selling NPLs to manage their asset quality, and as such there has been an influx of supply in the market. “I’d like it to be as soon as possible, but I really can’t confirm the timing yet. Because of the influx of supply, we’re not seeing very good bids in terms of pricing, so we have to basically keep trying,” he explains. CIMB Group bought into the Thai bank, then known as BankThai, back in November 2008 and became its controlling shareholder two months later. CIMB Thai, the ninth largest by assets in the country, is now a 93.7%-owned subsidiary. Kittiphun took the helm of CIMB Thai in late 2016, when asset quality issues were pervasive in the industry, particularly among SMEs and in the agriculture sector. Upon joining, he and the team identified “weak quality loans” that could potentially turn bad. “The ones that went bad last year and the beginning of this year were the ones that were on our list,” he remarks. CIMB Thai had been saddled with a number of legacy bad loans from the BankThai days. “These were in a variety of sectors. But the newer NPLs in the last two years were just in two or three main sectors. We had issues with rice millers last year … but most of these have been impaired already,” he says. He predicts that the bank will face some issues with a few companies in the rubber sector “beginning this year and perhaps towards the middle of this year”. “Three or four years ago when the price of rubber had gone up, there were significant investments by these players. Now, when the price is not as strong as it used to be, some are facing liquidity issues. So we’re seeing a few [accounts] that are more likely than not going to turn into NPL this year,” he says. However, the bank’s expectation continues to be that NPLs will bottom out from this year. “This year, there could be some more [NPLs] to go, but that should be sorted out by the third quarter of this year,” he says. It was only last year that CIMB Thai returned to a full-year net profit of THB385 million after having slipped into a loss of THB630 million in FY2016. Economists expect Thailand’s economy, which had seen sluggish growth since late 2013 due to political unrest, to improve further this year from 3.9% growth last year. Kittiphun says the improvement in the economy has so far yet to really funnel down to the general population. “In Thailand, up until about three years ago, loan growth used to be 1.5 times to 2 times GDP growth. But for the last three to four years, loan growth is not even 0.5 times GDP growth. However, now that the private sector is starting to look a bit more positive in terms of their investment plan, I think we’ll probably start to see more private sector investments in Thailand and that should lead to higher loan growth,” he says. He aims for the bank to grow loans by about 5% this year after 3.2% last year. “The growth for us will be mostly from wholesale and retail loans. We’re making a conscious effort to de-risk our commercial banking portfolio because of the asset quality issues, so that may actually drag the growth down a bit,” he says. According to Kittiphun, the bank has internally launched a five-year transformation plan this year in a bid to become a more relevant player. Without revealing too much, he says the plan involves diversifying its loan portfolio and scaling up consumer loans significantly. As at end-March 2018, its gross loan book stood at about THB213 billion, of which about 54% comprised consumer loans and the rest, wholesale and commercial loans. “The bank has set a five-year aspiration to try to become a mid-tier bank, which means that for the next 12 to 24 months, we have to build the right infrastructure, build the right capability for the bank to grow on a very strong foundation. So this year, we’re investing quite a bit on product capability. In the SME sector, for example, we’re building credit underwriting tools and monitoring tools,” he says. Analysts point out that the group has been closing branches substantially in Thailand as it looks to go increasingly into digital banking. It is down to 84 branches now compared with 165 in 2013. While CIMB Thai is not a big contributor to CIMB Group’s earnings — it accounted for only 3% of group earnings last year — it, along with the Indonesia unit, has weighed on the group’s performance in recent years given the high provisions made for bad loans. 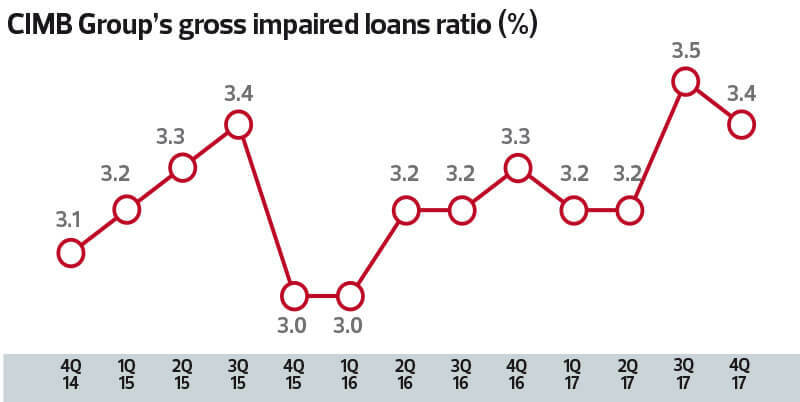 Last year, the regional banking group’s gross impaired loan (GIL) ratio ticked up 10 basis points to 3.4%, the highest among Malaysia’s eight banking groups. Analysts say the group’s GIL ratio will improve this year on the back of continued recovery in Indonesia and the bottoming of NPLs in Thailand. The Indonesian bank, PT Bank CIMB Niaga Tbk, is the biggest overseas contributor to group earnings at 21% last year, followed by Singapore (5%). Last week, CIMB Niaga reported a 37% increase in first quarter net profit to IDR876.6 billion, helped by higher non-interest income and lower impairment allowances. Absolute gross NPLs declined 9% y-o-y, while its NPL ratio improved to 3.51% from 3.75% in the preceding quarter, and 3.91% in 1Q2017. CIMB Group is expected to report its 1Q2018 numbers on May 30. Most analysts have a “buy” call on the stock, and expect it to report a better net profit this year. It made a net profit of RM4.5 billion last year, and ROE improved to 9.6% from 8.3%. “We believe earnings/ROE recovery will continue in 2018, led mainly by Indonesia credit costs narrowing further and a cleaner Thai book, coupled with some acceleration in loans growth (we forecast 6% for the group), and an improving Malaysia net interest margin after the 25bps hike in the overnight policy rate (in January)” says Nomura Research in a March 1 report. The stock, which has gained 12.7% this year, closed at RM7.25 last Friday.